Anyone who has to deal with moulds will sooner or later want to grow them. Identification of moulds most often depends upon observing their methods of spore production, which are not always obvious in the natural habitat. Often identification becomes so difficult that it is necessary to send a specimen to a distant university or government laboratory. Such specimens should preferably be sent as living colonies that can be grown out at the identifier's convenience. Even when the mould can be identified in its natural habitat one may still want to cultivate it - to get more material for study perhaps, or to learn something about its physiology. Whatever one's reason for growing moulds, one needs to understand a few things about their nutritional requirements before starting. Moulds, like people, need a source of energy, a source of nitrogen, a few minerals, and sometimes vitamins. Some moulds are rather specific as to the source of these materials, and, like people, must have them in rather complete forms. In contrast, many fungi can supply all their nutritional needs from very simple materials and construct bit by bit all the highly complex molecules they need. If man has such abilities, he would be able to drink a paper cup full of a simple seawater solution, eat the cup, and go off to work confident that he had eaten a square meal! Whatever a particular mould needs, it must always be supplied with some form of organic carbon for energy, a source of nitrogen for protein and vitamin synthesis, and several minerals. The substance on which a mould is grown in the laboratory is called a medium and the mould growing on it, a culture. Culture media can be solid or liquid, depending on the sort of information one wishes to obtain. For the purposes of identification, solid culture media are usually more useful, as they allow the mould to sporulate more easily. Most culture media are prepared by dissolving the necessary nutrients in water, to obtain a balanced solution supplying everything the mould needs for growth. Preparation of solid media involves dissolving a solidifying agent in the solution that will harden to a gel upon cooling. In the past gelatin was used for this purpose, but is was soon found that gelatin, a protein, itself could serve as a nutrient for some fungi. As they grew on the gelatin, these fungi would cause it to liquefy, thus destroying the solidity of the medium. Since the 1880s, a substance called agar-agar (or, more commonly, just agar) has been the solidifying agent of choice. Agar has the property of dissolving at a fairly high temperature (nearly that of boiling water) but solidifying at about 45°C. Thus, it can be poured over living fungi without killing them, yet can be used for organisms that grow at high temperature. Agar is relatively stable and cannot be consumed by most organisms, aside from a few specialized bacteria. It is extracted from certain marine algae or kelp by a complex industrial process. It is fairly expensive these days, but extensively used in various food and industrial products, as an emulsifier, thickener, or jelling agent. Most culture media fit into one of three categories: (1) synthetic, (2) semi-synthetic, and (3) natural. Synthetic media are composed of ingredients of known chemical composition and concentration. These media are useful in physiological or descriptive studies when it is necessary to duplicate exactly a previous batch of medium or to record the effects of the deletion or addition of a particular substance. Few fungi show their best growth on synthetic media; they must sacrifice speed in order to build their necessary cell components from relatively simple materials. However, many produce the sporulating structures necessary for identification more easily on synthetic media than on other kinds. Semi-synthetic media resemble synthetic media in containing a known set of ingredients, but differ in that at least some of the ingredients are of unknown or variable composition. A synthetic medium, in which all ingredients are chemically defined, can be made semi-synthetic by adding a substance such as yeast extract. We know that the yeast extract contains thiamine and other vitamins, but we do not know the exact amounts or what else might be present. The result is a medium of quite predictable composition but one not completely known chemically. Semi-synthetic media are widely used in routine work and offer something of a compromise between synthetic and natural media. Natural media are so called because they are partly or completely composed of natural materials, such as ground-up (or whole) plants or animals. A slice of potato is a natural culture medium, as is a piece of meat or bread. Some natural media may consist of a synthetic medium augmented by tomato juice, carrot strips, or plant stems. Natural media are often very good and allow sporulation in fungi that may otherwise remain sterile. Their major disadvantage is that they may differ considerably from batch to batch and thus not yield reliable experimental results. Nevertheless, natural media are widely used in laboratory work and cannot be replaced by any other kind. Liquid media are employed in laboratory work when the entire colony must be recovered for weighing or chemical extraction. They are also useful when the culture medium itself is to be analysed for chemical changes. For identification purposes, liquid media are seldom chosen because few moulds sporulate well on them. The exception is in work with yeasts, a group of fungi especially adapted to liquid environments. It has often been pointed out that any medium containing agar is at best a semi-synthetic medium. Agar contains numerous mineral elements and cannot conveniently be purified, even by repeated washings. Thus, for physiological studies, liquid media should be used. The media described below have been chosen because they represent a sample of the variety of types used by mycologists. There are, however, many additional media; persons interested in pursuing this matter further should consult the more specialized literature. Czapek's Solution Agar is a synthetic medium widely used in mycological laboratories, particularly for the identification of species of Aspergillus and Penicillium. Many moulds produce very characteristic colonies on it and may also exude pigmented substances. Aerial growth is often suppressed and sporulation may be enhanced. Some moulds, however, grow poorly on this medium and may even fail to sporulate altogether, often because of their inability to synthesize vitamins. Many members of the Zygomycota are unable to process sucrose or nitrates and will do very poorly on Czapek's. The high glucose level may also cause problems. As noted above, the addition of agar to this medium makes it, in reality, a semi-synthetic one. 2. Buffer stock : 60.6 g/l Tris adjusted to pH 7.8 with HCl. 3. Micronutrients + vitamins stock: One litre stock prepared by mixing 5 ml each of 54.4 g/l NaH2PO4.H2O, 12.6 g/l FeCl3.6H2O chelated with 17 g/l of disodium salt of EDTA, 12.2 g/l H3BO3, 732 mg/l MnCl.6H2O, 922 mg/l ZnSO4.7H2O, 29 mg/l Na2MoO4.2H2O, 47.6 mg/l CoCl2.6H2O, 40 mg CuSO4.5H2O, 40 mg/l thiamine chloride, 2 mg/l biotin, 2 mg/l vitamin B12. The complete mixture contains in a final volume of l litre: 15 g agar, 100 ml each of major salts and micronutrient stocks, and 10 ml of buffer stock. This medium was formulated by Dr. I. Ahmad for the cultivation of Penicillium species. Although it appears at first glance to be a complicated and difficult medium it is usually prepared from three stock solutions and does not take as long as one might expect. It can be modified in several ways to assess the physiological activities of moulds. Most commonly different sources of carbon are substituted for glucose and different nitrogen sources for nitrate. As formulated above,with nitrate as a nitrogen source, it may be unsuitable for certain fungi, such as many Zygomycota, unable to utilize nitrates. In such cases it may be better to use ammonium salts, although this may result in dramatic plunges in pH. Again, to be truly "synthetic", the medium should be used without agar. Leonian's medium was devised by the American mycologist L.H. Leonian, and was designed to promote sporulation in certain moulds. Later, at the University of Toronto, R.F. Cain found it to be more suitable for ascomycetes if it contained a little yeast extract; hence the term "modified" in its name. It is a good general purpose medium that will yield good growth with most fungi. Certain fungi, such as many mycorrhizal forms, will not grow on Leonian's Agar because they are unable to use maltose as an energy source. For these fungi we use Modified Melin-Norkran's medium, which has a glucose energy component. Heat potatoes at 60░ C for 1 hour and filter through cheesecloth. Make up volume to 1000 ml and add other ingredients. Cook 1 hour and then sterilize. Potato Dextrose Agar, or PDA, as it is usually called, is an old formula used by plant pathologists and many mycologists for general laboratory use. This is the standard medium used in medical mycology. It is probably no better for these moulds than Leonian's or PDA but is simply the traditional choice and thus the medium that must be used if colonies are to be compared with those described by medical workers. It can be used as a general laboratory medium in place of Leonian's or PDA, although the amount of glucose is rather high and may suppress sporulation in some fungi. Ten millilitres of a 3.3 g/l stock solution of rose bengal is added to the medium after the other ingredients (except the streptomycin) have been dissolved. After sterilization, the streptomycin is added to the cooled medium. This medium is useful in plating techniques (see below) when the aim is to slow down the growth of colonies in a mixed culture. It discourages the growth of bacteria and certain other organisms so that they will not swamp isolates from natural materials. DPYA is an excellent medium for isolating fungi from soil, dung and other natural substrates. The oxgall and sodium propionate restrict the growth of some rapidly spreading fungi, while the chlortetracycline and streptomycin discourage bacteria. It can also be prepared as a more general-use medium by omitting these four inhibitory substances. The V-8 juice used in this medium probably contains many nutrients that fungi can use, but we have little idea what they may be. It is a medium that is used routinely in plant pathology and seems to be a good complement to Leonian's or PDA. Moulds that fail to sporulate on those media often sporulate heavily on V-8, or vice versa. Weitzman and Silva-Hutner's medium was designed to enhance sporulation in certain medically important fungi, but is useful for a great many other moulds as well. I have found it to be a good (and often better) substitute for V-8 Agar and use it routinely in my laboratory. I grow most of my moulds on both Weitzman and Silva-Hutner's and Leonian's Agar and find very few that fail to sporulate on one or the other. Although the original formula calls for a final pH adjustment, I seldom do this and yet get good results. Culture media are not hard to prepare, even under relatively primitive conditions. It is often easiest to dissolve the agar separately in hot water and then add the other ingredients. The agar burns easily when it is heated, so it is best to avoid putting it directly on the stove or hotplate. I usually put the agar in a flask of water and then immerse this in a boiling water bath. After an hour or so the agar will be dissolved and the solution will be clear. Some people do not worry very much about whether the agar is completely dissolved or not, but to avoid an uneven batch it is best to be patient. Once the agar is dissolved the rest of the ingredients can be stirred in; they must be completely dissolved as well. Some ingredients, of course, do not dissolve and must be mixed in suspension as thoroughly as possible. Figure 9. Glassware for cultivating moulds. A: Petri dish with lid partly removed. 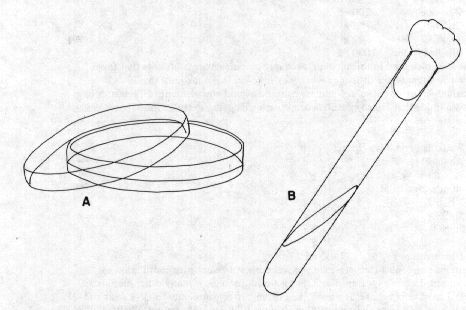 B: test-tube with agar slant. When the medium is completely mixed it must then be prepared for sterilization. Here one must stop and decide what use is to be made of the finished product. If fresh isolates are to be made from natural materials or some mould we already have is to be studied, we will probably want to use Petri dishes (Figure 9A). Petri dishes are small, round dishes, most commonly 9 cm in diameter, that have a bottom and a loosely fitting top that will admit air but discourage entry of foreign spores. They are the most commonly used vessels for growing moulds and are available either in permanent glass or disposable plastic form. The plastic plates are already sterile when bought, but the glass ones must be heated in the oven at 230°C (450°F) for 60 minutes, to kill all foreign organisms and spores, before they can be used. But more about Petri dishes later. It is often necessary to save cultures for later use, or for mailing, in a way that they are less vulnerable to contamination by airborne spores. 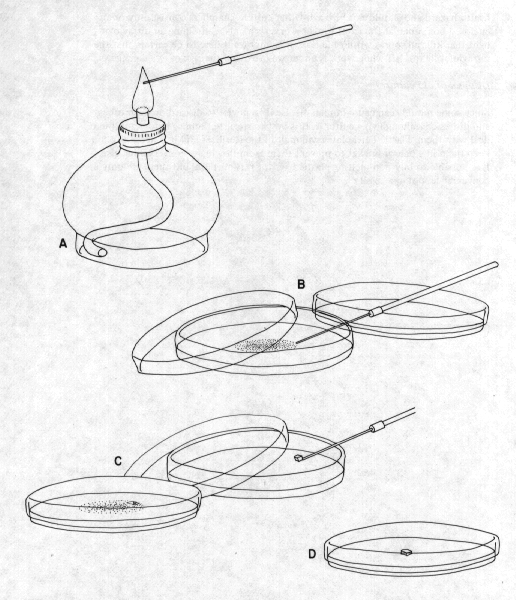 The conventional method is to use test-tube or bottle cultures that have only a narrow opening (Figure 9B). The culture medium is poured into the tubes, sterilized, and allowed to solidify at about a 30°angle. When cool, the agar inside has a smooth slanting surface for the colony to occupy. The tube or bottle is capped with a cotton plug that is just tight enough for the tube to be lifted without it coming out. In place of cotton a screw cap or one of several tube-capping devices can be used. With the use of medium in mind, one can now proceed to prepare it for sterilization. If it is to be used in Petri plates it should be transferred into smaller containers that will make it easy to pour. It is impractical to sterilize filled Petri plates, so we pour them after sterilization. If the medium is to be used in tubes, they should be filled before sterilization and slanted afterwards. Sometimes it is advantageous to save sterilized medium in larger bottles and melt it down later to pour plates. Sterilization is most often done in some kind of apparatus that will allow steaming at high pressures. In the laboratory we usually use a large sterilizer called an autoclave, but a simple pressure cooker works well, provided it has a pressure gauge. Most fungi and other organisms can be killed by boiling water, but there are a few, notably bacteria, that have highly resistant spores requiring sterner means. To be sure of killing everything, we sterilize at 121°C (250°F) for 20 minutes. To obtain this temperature the pressure must be raised to 1 kg/cm2 (15 lb per in.2 or 1 atmosphere). When medium is sterilized in an autoclave it should not completely fill its container. Attempting to sterilize 1 litre of medium in a 1-litre flask will usually result in sudden and rather explosive boiling when it is removed from the autoclave. It is best not to fill the container more than half full. Inexperienced mycologists often assume that the 121°C for 20 minutes rule applies in all situations. However, not all materials will heat up enough to be sterilized in 20 minutes. It is an unpleasant surprise when a litre of medium becomes contaminated with bacteria because the person doing the sterilization attempted to do the whole batch in one container and barely managed to heat it to 100°C before the time was up. After sterilization the medium is allowed to cool and solidify. Petri plates must be poured before the medium solidifies but while it is fairly cool. We usually test the medium by holding it against the inner side of the forearm; if it is cool enough to be poured it will not feel too hot. Beware, though of letting it cool too far, lest it solidify in the bottle! Pouring the medium when it is too hot results in unwanted condensation on the lid of the Petri dish. Tubes, as stated above, should be left to solidify on a slant. Any agar medium that has solidified can be melted by heating in a boiling water bath. Melting of a 1/2-litre bottle of solidified medium will take about an hour if it is submerged well in boiling water. Petri plates dry up rather quickly, so it is often convenient to keep a number of bottles of solid sterilized medium that can be melted and poured when needed. When Petri plates are poured from melted agar, the neck of the bottle should always be heated over a flame first, either alcohol or gas, to kill any stray spore that may be on it. Once some Petri plates or tubes of sterile agar have been prepared, cultivation of one's moulds can begin. For the sake of simplicity, let us first suppose that a mould colony is already growing in a Petri dish and must be transferred to another. The essential thing to remember is that the air and all implements exposed to it are contaminated with mould spores and that these would germinate and grow if they got into the sterile plate. The steps we take to avoid this contamination constitute what is called sterile technique. 1.Take an inoculating needle, usually a thin needle or wire at the end of a long pencil-like handle, and heat it in an alcohol or gas flame until it glows bright red (Figure 10A). 2.Allow the needle to cool for about 15 seconds. (A hot needle will kill the mould that is to be transferred). 3.Open the Petri dish containing the culture just wide enough to allow entry of the needle. 4.With the heat-sterilized needle, cut out a small portion of the colony margin. Hyphal tip transfers work best as they are usually the most active parts of the culture; in addition, transfers from the heavily sporulating central portions will result in spores being spread into the air. Especially in medical work, hyphal tip transfers are essential. The excised colony margin should be only about 1 mm square (Figure 10B). 5.Transfer the square of colony margin to the sterile plate, making sure that the lid is opened only wide enough to admit the needle and make the transfer. Place the block at the centre, withdraw the needle and flame it until it is red hot, to kill all adhering spores and hyphae (Figure 10C,D). 6.Close the lid; label the plate with a marking pen, including name of culture and date. We usually wrap a thin strip of paraffin film around the sides of the plate to cover the opening, but this is not absolutely necessary; just a couple of pieces of masking tape to hold the lid down will do. 7.Leave the culture to grow in a protected place that has as little air movement as possible. Figure 10. Steps in sterile technique. Inoculating needle is heated in an alcohol flame (A). Small piece of colony is removed from Petri dish (B) and transferred to a new dish of agar (C), yielding a plate containing a piece of the old culture at its centre (D). Transferring from plates to tubes, tubes to plates, or tubes to tubes is done in a similar manner. When using tubes, always flame the mouth to kill any spores of airborne moulds. Never put the cotton plugs or lids of tubes on the table as they will pick up contamination. The table itself should be clean and can be washed with water, alcohol, chlorine bleach, or other disinfectants. Some spores can survive long immersion in these substances, however, so one cannot thus expect to kill all spores on the table. Many laboratories are now equipped with special inoculation chambers. Some, such as laminar flow chambers, have a layer of sterile filtered air flowing over the culture that excludes contaminating spores. Some models of such chambers, however, carry the air over the culture and into the worker's face. Such a device is a health hazard and should not be used. Other culture chambers consist only of an enclosed box, open at the front for the worker's hands, containing an ultraviolet light that kills all spores within the box. It is important here to be certain that the ultraviolet light is off while work is under way to avoid the risk of eye damage. Since some moulds can cause human disease it is unwise to discard or wash tubes and dishes containing living cultures. It is best to sterilize them as before and then deal with them. Plastic Petri plates will melt in the sterilizer and it is necessary to keep them in a pan or bucket to prevent them from flowing over everything else. It is possible to buy non-melting plastic bags for this purpose, but these are only a convenience, not a necessity.